How can a lot of loose electrons cause a metal to be a good conductor? This is because each electron is an electric charge that is free to move. Moving electric charges can make up a current. But this is only true if they move the same way. Due to thermal kinetic energy of the electrons and ions in the metal, these conduction electrons move in a random, disordered way, with a velocity close to 106 m/s. In total, however, they have zero net velocity because their motion is not ordered. However, if an external field is applied, then the net motion of the electrons will follow the field. © 2018, Francisco Esquembre , Universidad de Murcia; Maria Jose Cano; lookang http://weelookang.blogspot.sg/. What is drift velocity in conductors? This model has 30 atoms mass=1000 u, charge = +1 unit, and 50 electrons, each 1 u, charge = -1 unit, demonstrates the drift velocity, the flow velocity of in this case negative charge carriers such as electrons, attains due to an electric field. It can also be referred to as axial drift velocity. In general, an electron will 'rattle around' randomly in a conductor at the Fermi velocity. An applied electric field will give this random motion a small net flow velocity in one direction. When a battery is connected to a wire, the battery will maintain a potential difference +(left) and -(right) for example between the two ends of the wire. In that situation there will be a field in the wire setup pointing to the right, and charges will flow to the left(and keep flowing) in response to this field. the mobile charges carriers (often electrons) move about randomly, scattering off atoms and molecules. When there is no electric field in the conductor there is no net charge flow. Applying a potential difference, which sets up a field, is much like creating a pressure difference in a gas. In both cases there will be a net flow or charges or gas particles respectively. For the charge carriers in a metal simulation-model, the applied field when E = positive, it superimposes a net drift velocity (or average speed) vd to the left onto the random motion previously there. similarly, when the applied field when E = negative, it superimposes a net drift velocity (or average speed) vd to the right onto the random motion previously there. 1. select from the sliders or enter values via the input fields and click on the “play” button. 3. notice sometimes when the electrons travel to near each other, they tend to repel as they have the like charges. 4. notice the atoms vibrate in their fixed lattice positions, and with increasing temperature, the vibrations have higher kinetic energies and higher amplitudes. 5. Select checkbox "showTrace" will show the path traveled by a single electron to ease your visualization of the path and allow your deduction on the average velocities of the electrons, thus the drift velocity along the direction of the conductor current and opposite to the electric field. 6. Hence or otherwise, describe net drift velocity in metal conductor and explain the factors which affects net drift velocities. 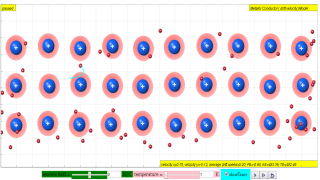 1. increase the temperature, this model can be used to visualise the effects of increased temperature on the vibrations of atoms fixed in their relative positions like a solid. This can help students figure out that increase in temperature can have an effect on the drift velocity of charge carriers and the resultant opposite direction current flow. 2. Notice potential energy, kinetic energy and total energy are added to allow linking of knowledge to kinetic theory of gases. 3. reversing the electric field while the simulation is playing, the drift velocity allows student link this idea to the non-instantaneous lighting up of light bulbs when electric circuits are connected, plan and conduct your own experiment to collect evidences to support or rebute this claim. 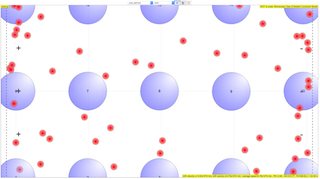 4. explore your own scenario here to test your initial understanding thereby showing an appreciation of the atomic structure and mobile charge carriers electrons . 5. How can a lot of loose electrons cause a metal to be a good conductor? This is because each electron is an electric charge that is free to move. Moving electric charges can make up a opposite direction current. But this is only true if they move the same net direction at a drift velocity.